Poly(vinylidene fluoride) PVdF is used as binder resin for anode of Lithium Ion battery. I found very interesting report written Japanese chemical company, Hitachi Chemical co.. They say, the swelling of binder resin disrupt conductive networks. Let’s analyze this phenomena with Hansen Solubility Parameters (HSP). Binder Resin swelling -> Reduce Carbon black contact. At first, I checked solubility of PVdF. And I appended several solvents information from Polymer HandBook. I got 52 solvents data. Score =1 (red square) are Good Solvents or Good Swelling Agents. Score =0 (blue lozenge) are PSA or NS. Plot these solvents in Hansen Space, all Good Solvents and Good Swelling Solvents are coming together and make Sphere. And the center of Sphere is determined as PVdF’s HSP. This case dD=19.4, dP=15.9, dH=11.3 are PVdF’s HSP and write as [19.4, 15.9, 11.3]. And the radius of sphere is 9.6. There are 7 exceptions. All of them are Wrong out (Distance from PVdF is long even though, they dissolve PVdF). We need apply Double Spheres technique for this problem. See the end of this article. As Electrolyte Solution, Ethylene Carbonate : DiEthyl Carbonate : DiMethyl Carbonate =1:1:1 is most popular. HSP of Solvents mixture can calculate with this scheme. So, Solvent[16.2, 12.2, 6.1] to Polymer[19.4, 15.9, 11.3] HSP distance become 9.04 (Sphere Radius 9.6), and this means PVdF will dissolve or Swell by this solvent. In Hitachi Chemical report, they did not reveal co-monomer. But they said, they tried to increase polarity of polymer. The PVdF polymer already have very large dP value. So, they might try to increase dH. How can we increase polymer dH? You can easily increase dH if you introduce Hydroxy group into polymer. HSP of Poly(vinyl alcohol) PVA is [15.9,8.1,18.8] by estimation. 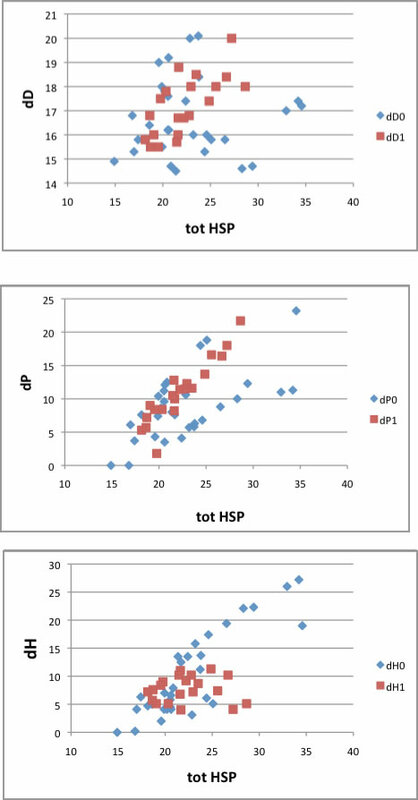 Then we can calculate mixture HSP of PVdF [19.4, 15.9, 11.3] and PVA [15.9,8.1,18.8]. The distance from solvents should larger than 9.6, PVdF ratio should lower than 40%. You can get above chart, if you use spreadsheet and make below table. Then how we can get such polymer? In many case, PVA is made by hydrolysis of poly(vinyl acetate) PVac. So vinylidene fluoride and vinyl acetate co-polymerization is one of the answer. But introduction of each monomer is depend on monomer reactivity ratios. If radical polymerization simulator is still working, please try. so, we get reactivity ratios by Alfrey and Price Qe Theory. I made Monte Carlo (MC) simulator, and analyzed. Maybe you would better reduce Vac ratio and make several polymer and find most suitable ratio in real work. If you try to use Hydroxy ethyl Methacrylate(HEMA), you need care. Initial monomer ratio VdF:HEMA=50:50, 99％HEMA polymer will produce. If we use HSPiP and Pirika simulator, we can design real materials. I used usual one Sphere (with option GA), I got [19.4, 15.9, 11.3] and Green Sphere radius is 9.6. You can see 7 exceptions (Blue Sphere out of Green Sphere) left down to Green Sphere. The exceptions solvents reduce to 2. 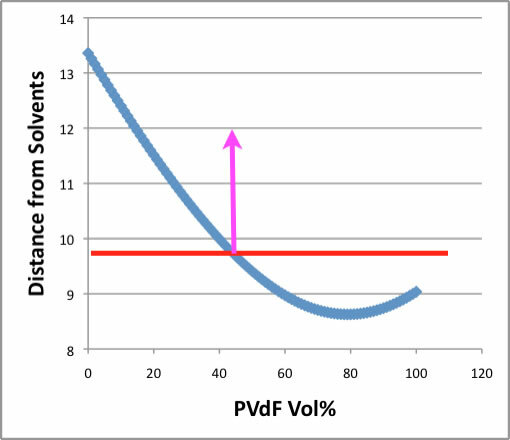 And we can understand PVdF solubility phenomena more easily. Why PVdF have double natures? but PVdF case, it is said that about 10% of abnormal bonding exist.